You know the kinds of people who want to give up all the comforts of modern life when they go camping, and you know that you’re not one of those people. Admit it, you love living in the city and you love getting out in nature but you don’t want to choose between the two. 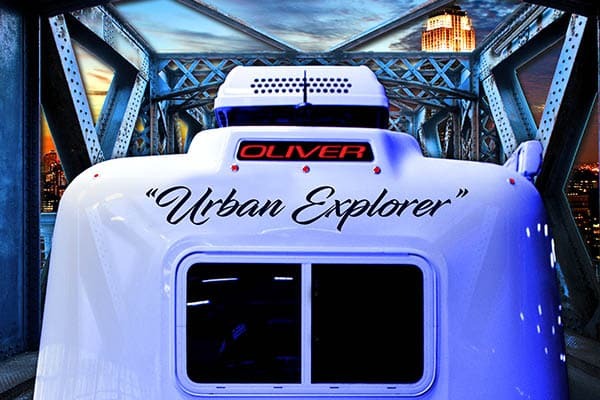 You just might be an Urban Explorer and traveling from one campground to the next is the perfect thing for you. Getting away to a campsite in a travel trailer means you keep the comfort you’re used to with a kitchen, hot running water, comfortable furniture and private bathroom facilities. Plus, you can still go hiking, fishing, boating, or any other nature activity in your camping area. It really is the best of both worlds. Towing a trailer also means you can unhitch and take the towing vehicle into the nearest city for a night on the town. Who says you can’t enjoy hiking, canoeing and a nice meal downtown all in the same day. And all without an expensive hotel bill. Olivers are great for those who enjoy exploring nature as much as they do visiting new cities. Our trailers are made especially to be aerodynamic and stable while towing. In fact, our 22-foot trailer is big enough to relax in and contained enough to transport easily. Plus, our double-hulled fiberglass construction means you’ll be as comfortable in upstate New York in the winter as you will be outside of Phoenix, Arizona in the summer.